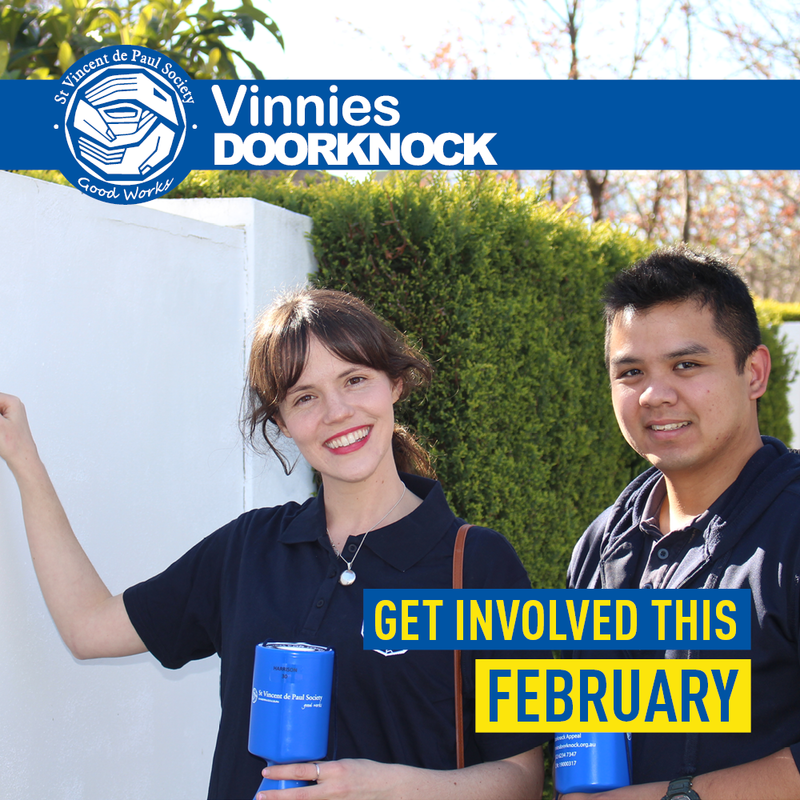 The Vinnies Doorknock Appeal has been running for over 30 years in Canberra. Each February, around 1,400 volunteers doorknock in over 1,300 collection areas and raise over $280,000. This represents approximately 55% of the prospective collection areas, which means we still have 45% of Canberra that we haven’t been able to reach because we do not have enough volunteers. Monday - Friday between 5:00pm and 7:00pm. 18 yrs and older can doorknock alone or in pairs. Through home visitations by conference members, each year Vinnies receives over 17,000 calls for help and provides $2 million in emergency assistance to persons in need. The funds raised through the Doorknock Appeal are vital to enable the Society to continue this core work. Additionally, donations received through the Doorknock Appeal help support non-government funded programs such as the Night Patrol, St Nick’s Young Carers Program and the Clemente tertiary education program. if you are 17 years or under. After receiving your email we will put you in contact with the coordinator of your chosen area, who will organise your doorknocking kit and provide you with detailed instructions. A doorknock area is usually between 30 and 40 houses, which takes 2-3 hours to cover. Yes you can go with friends and family. It’s a great opportunity to volunteer with a friend and it is one of Vinnies’ few group volunteering opportunities. I can’t doorknock due to physical restraints, can I still be involved? If you would like to get involved but aren’t able to doorknock you can volunteer at a collection table. These are located across some of Canberra’s shopping centres throughout February. Do I have to doorknock in the area where I live? No, you can doorknock in any area you wish across Canberra that has not yet been allocated to another volunteer. Yes. According to research conducted by LinkedIn, 41% of hiring managers consider volunteer work to be as valuable as paid work experience and unemployed people who volunteer are 27% more likely to be hired than people who do not volunteer. Yes, some coordinators give out certificates to their volunteers. If you specify that you would like a certificate of thanks to the Vinnies marketing coordinator, we can organise one for you to collect from the Deakin office. On collection of your doorknock kit the coordinator will give you a quick rundown of how to doorknock and answer any questions you may have. You will also receive a doorknock volunteer instructions pamphlet in your kit.